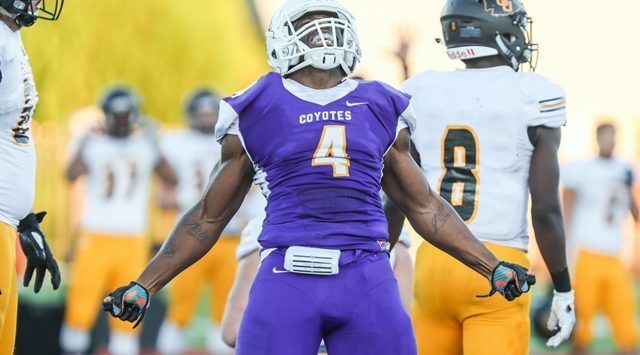 Kansas Wesleyan’s Shaq Bradford (JR/San Diego, Calif.) has been named as the KCAC Football Defensive Player of the Week for his efforts for the then No. 11 ranked Coyotes in Saturday’s 56-0 win over Saint Mary. For a second consecutive week Bradford was huge for the Kansas Wesleyan defense. He recorded 3.5 sacks among his five tackles on the night as the KWU defense recorded its second shutout of the season in a 56-0 win over Saint Mary. Bradford led a KWU defense that held Saint Mary to 220 yards of total offense, 123 yards under their season average, and to only 25 yards rushing in the game. The shutout win marks the first time since 2002 that KWU has recorded multiple shutouts in a season. The victory moved Wesleyan to 6-0 overall and 5-0 in the KCAC. The Coyotes, who moved up to No. 10 in the NAIA Top 25 Coaches’ Poll also released on Monday, host the Tabor College Bluejays on Saturday at 1:30 p.m. on Bissell Field at the Graves Family Sports Complex.